There’s nothing quite like a juicy burger to fill an empty stomach. We’ve rounded up a few burgers for you to try on your visit in Mesa. 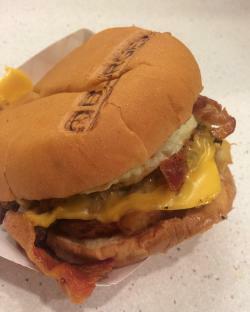 Whether it is morning, afternoon, or evening the Breakfast All Day Burger at BurgerFi will hit the spot. Topped with American cheese, bacon, maple syrup (yes, you read that right!) hash browns, a fried egg, grilled onions, and ketchup this burger has the perfect balance between sweet and savory. We won’t judge if you save some leftovers to actually eat for breakfast the next day. Over a dozen of the Valley’s best chefs and restaurants went head to head in the 2016 Burger Battle and the “Bruce Lee” from Zinburger was named the Judge’s Choice Winner. It’s not hard to see why - Asian BBQ sauce, avocado, jalapeno, Napa cabbage slaw, cucumber, rice wine vinaigrette, and Sriracha mayo work together to make this burger the best thing you’ll eat all week. If you are checking out Downtown Mesa, you won’t have to go far to enjoy Haven Burger. Their entire menu is made with natural, fresh ingredients that are locally sourced. The shining star on the menu is the “Haven” burger, named after the burger joint itself. 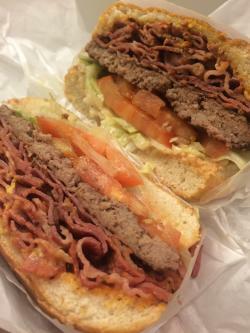 Topped with pastrami, it is a combination you don’t want to pass up. Stufrageous Stuffed Burgers has some outrageously delicious menu items. Their Mac N Cheese burger will have your stomach stuffed with its mac n cheese, bacon, and sliced jalapeno filling. If you’re feeling adventurous you can create your own burger with your choice of stuffings, sauce, and toppings. Skip the PB & J lunch for a mouthwatering Peanut Butter Burger at Flip’s Burgers & Brews at Mesa Riverview. An angus burger topped with creamy peanut butter and bacon creates a unique taste that is sure to satisfy. With a great lineup of traditional and unusual burgers, there is something for all of your taste buds. Let us know what burger you try! Include #VisitMesa in your burger post on social media.